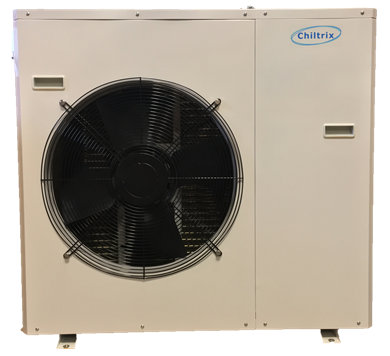 The Chiltrix CXSE adds a "free cooling" option to CX34. Yes, it looks like the chiller, but it sits next to the actual chiller and this houses the water coils, fan and electronics to divert the water loop through this module when its cold enough outside to harness free cooling from the outside. This allows you to get free or very reduced cooling costs depending on the outdoor temperature. Server rooms need cooling all year, even when it is cold outside. If you operate in a northern area with cold winters, this option is for you. 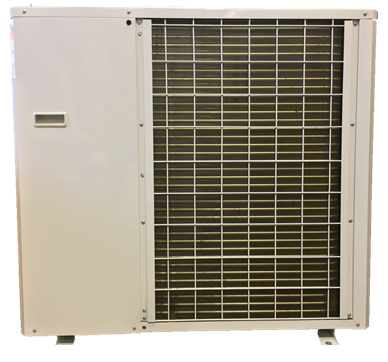 When outdoor temperatures drop below 38°F, the CX34 glycol-water loop is automatically extended through a special water-to-air heat exchanger to harvest outdoor cold ambient conditions to pre-cool the glycol-water loop so that the CX34 variable speed compressor can drop to a very slow speed and consume less power. This can save about 50% off of it's already low power consumption without lowering capacity. At and below 28°F, the CX34 chiller with Free Cooling SE add-on will turn off the compressor entirely and still be able to maintain its rated cooling capacity using only the variable speed pump and fan motors. At this point, the CX34 achieves a COP of of >41 and EER of >141. Enjoy the savings of 2 tons of cooling for less than 75 watts. The colder it gets, the less water flow rate is needed, allowing the VSD pump power draw to drop under 20 watts. Depending on location, for some customers free cooling mode can be active up to 3 months per year during the daytime and up to 5 months per year at night.